It's been a long wait for those of us who watched season one as it was released. The January season finale changed everything, making the wait for the second season torture. But now, we are done being tortured, though the group of Eleanor, Chidi, Tahani, and Jason still have to endure the Bad Place yet again, as Michael is determined to make version two work. 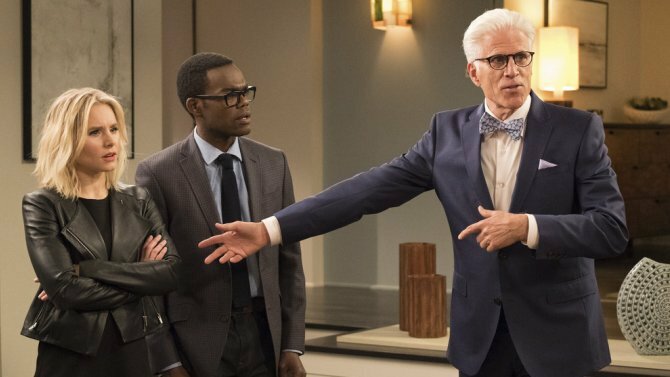 This two-part premiere sets up how this fake Good Place experiment will play out the second time, with Eleanor having one clue to lead her to what she knew last season. The episode begins with Michael meeting with Sean. Now that we know all about Michael, we get to see behind the scenes of this facade, and it is wonderful. We get to see him trying to prove to Sean that his idea is good, and we get to see him giving instructions to the actors, who turn out to be hilarious. In this new version of the "good place", Chidi has to decide between two women who could be his soulmate, which is the perfect situation for Michael to put him in. The new version also taps into all of Tahani's neuroses. Her house is tiny, there's a portrait of her sister on the wall, and her new soulmate isn't a great match for her. Jason is paired up with another Buddhist monk, and Michael tells him that he will never have to be alone. This is a great plan by Michael, since a big part of how Jason made it last time around posing as Jianyu is when he got to be alone and stop pretending. Eleanor and Chidi finally talk, and based on the note, Chidi ends up concluding that he doesn't belong in the Good Place (though not for the reason that he actually is in the Bad Place, but for the almond reason that he mentioned in the season finale). This makes the story move along, but doesn't keep them from figuring out too much too quickly. There is another reunion, Jason and Janet. Jason starts asking Janet questions, and things get on the track they ended up on during the first season. Instead of Eleanor getting drunk for her speech like Michael had planned, Tahani gets drunk, which is unique and entertaining. Other great moments from the first half-hour were Eleanor accidentally calling Janet and the former "real Eleanor" trying to bring life to her new character. And there were some great lines, such as Eleanor calling people nature's apps, and "Eleanor's soulmate" calling this job weird, unlike his former job in the twisting department. Things escalate faster than I expected. Even after the fast-paced first season, I never expected things to go this quickly, but I love it. Jason stops pretending to be Jianyu, and after that and all of the soulmates give the same line, she tells Michael that they aren't in the Good Place. However, like last time, she gives away too much. Last time, she told him that the four being close together helped them, and this time she told him about the note in Janet's mouth. This was a wonderful season premiere. Everything moved quickly, something that The Good Place does very well, and everything fit together logically and in an entertaining way. There is one issue that I have with this hour, and that's in its ending. Unlike the ending of the season one finale, the ending here gives no indication of how Eleanor will figure out what she learned before. Last time, her progress wasn't completely erased, but now it has been, at least as far as we know. What did you think of "Everything is Great!"? Leave your thoughts in the comments!